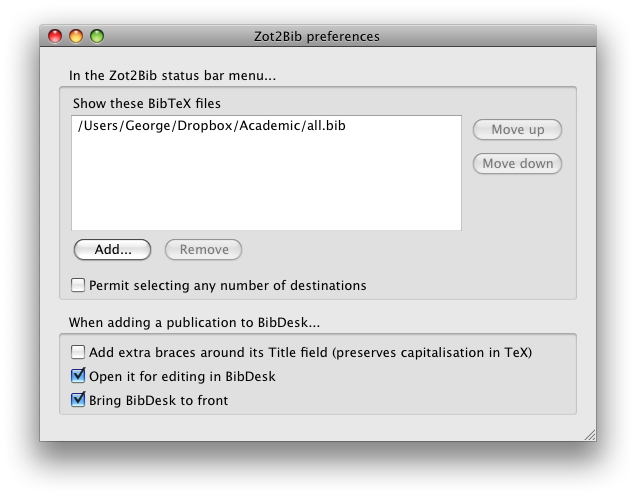 Zot2Bib is a Firefox extension that helps you combine the no-typing-required bibliographic magic of Zotero with the TeX-compatibility and Mac-like goodness of BibDesk. 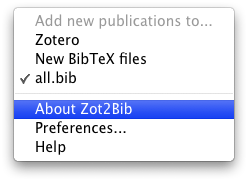 With Zot2Bib, any time you get something automatically added to your Zotero library, you can also have it automatically exported to one or more BibDesk documents. Zot2Bib is Mac-only and BibDesk-only. It’s not a generic BibTeX manager (maybe it should be… but it isn’t). Since Firefox has dropped support for traditional extensions, Zotero 5 now operates standalone. Zot2Bib version 2.0.7 has minor changes to improve compatibility with Zotero 5 standalone. Zotero’s ability to ‘scrape’ reference data from many academic websites, including Google Scholar, is incredibly handy. But I use LyX and LaTeX for academic work, so I want a reference database that’s BibTeX-native. I also prefer a database format and PDF file library layout I can easily understand and make part of my backup routine. And a pretty GUI. Enter BibDesk. Then again, storing references has to be one click, or there’s a risk I don’t bother. Hence this simple extension. Install BibDesk and create a .bib file as your main database. Download Zot2Bib. You may need to right-click and choose Save Link As …. Install Zot2Bib. In Zotero’s menu, go to Tools > Add-ons. In the Add-ons Manager, click the gear icon at top right, choose Install Add-on from File, and pick the .xpi file you just downloaded. Restart Zotero. You should see see a new Z2B icon at the top left of Zotero. Click that, then click Help in the pop-up menu for further instructions (you’ll need to set up one or more destination files using the preferences dialog, shown below). You might also find CiteULike useful. 2.0.7 Fixed some things related to internal Zotero changes. Help now works in Zotero standalone. Use within Firefox is no longer tested or supported. 2.0.6 Put menu icon inside Zotero, since Firefox add-on bar has gone away (also makes compatible with stand-alone Zotero). Worked around odd XUL menu checkmark display bugs. 2.0.5 Restored menu icon to add-on bar. 2.0.4 Updated compatibility with Zotero 3 (but accidentally moved menu icon inside Zotero). 2.0.3 Fixed issue on systems where MacRoman is not the default text encoding (by changing text encoding of AppleScript component to UTF-8 + BOM, based on info here). 2.0.1 Internal change only: switched AppleScript component to plain text format, to facilitate review by Mozilla. 2.0 Addition of multiple switchable destinations, various preferences, and an interface to manage them; fixed some character mangling issues; hosting on mozilla.org with automatic updates; compatibility with Firefox 3.5 and Zotero 2. Disclaimer. This extension contains only sugary goodness, but please don’t hold me responsible if anything bad should happen while you’re using it. Since Zot2Bib has a lot of dependencies, it breaks rather more often than I’d like. If there’s been a recent update to Firefox, Zotero, BibDesk or Mac OS X (and especially AppleScript), any of these could be causing problems. Let me know! Because Zot2Bib is hosted on mozilla.org now, you should get the appropriate update automatically. Even better, if you’re so inclined, just fork it on Github and get hacking. Please email me on george mackerron com. Or, if you’re feeling particularly appreciative, I wouldn’t stop you buying me a pint.